It is hard sometimes to find a table that can easily be used to seat children at family get together activities. Most of the time kids are resigned to sit on a blanket on the floor or be forced to sit at the adult table with a cumbersome booster seat, or worse yet, have to reach to the top of the table from their seat below. The Lifetime Kid's picnic table provides a suitable alternative to these cases. The model 80094 seats 4 younger children comfortably. Last night, I visited a coworker about some business ideas and they invited my family to stay for dinner. We had several younger children that were going to be eating with us and we had a table that could not seat everyone. We brought in the kid's picnic table and easily alleviated the problem. The table is very lightweight because of the polyethylene plastic table top and benches, yet sturdy due to the steel framing. Needless to say, it was a great dinner and everyone had their own seat. 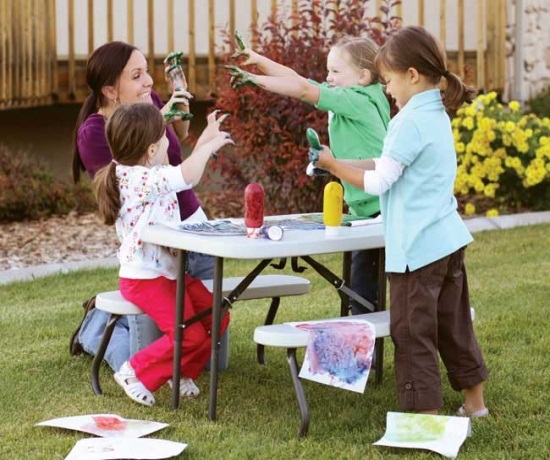 The children's picnic table from Lifetime Products also folds flat. 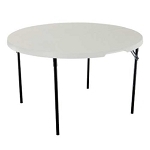 This fold-ability sets this table apart from other kid sized picnic tables, as most other's are permanently standing. Look for this picnic table to be available in Pink soon. Lifetime Products Children's folding picnic tables 4 pack. Model 480094 is great for family picnics, indoor and outdoor use. Save money per children's picnic table by ordering this 4 pack of folding picnic tables. Sturdy steel framing. Kids picnic table model 80232 from Lifetime Products. This table can seat 4 children comfortably, with a bench weight capacity 90 lbs. Lifetime Products offers a 2 year factory warranty. Lifetime Products Pink Children's folding picnic table. Model 80156 is great for family picnics, indoor and outdoor use. This pink kid picnic table is built with sturdy steel framing and a dense polyethylene plastic table top and benches. Your post is an inspiration for me to discover more about this subject. I must concede your pellucidity widened my sentiments and I will straightaway grab your rss feed to remain up to date on any approaching articles you might put out. My genuine thanks for a job well done! This was a really good read for me. Thanks for posting this helpful post. Took me time to read all the particular remarks, but I definitely appreciated the article. It proved to be very helpful to me and I am sure to all the commenters here! It's always nice when you can not only be educated, but also entertained! I'm sure you had fun writing this write-up. Thank you for the information provided. I love food and restaurants so this gives me great ideas. Thanks for putting this up. I searched on how to make watch good comments and after not getting much I found this which I learned about how a profile can make an impression. I am glad you enjoyed the post and information. I hope it is helpful for you with your experiences with Lifetime kids folding picnic tables.